Larry J. Sabato's Crystal Ball » OBAMA AND THE PRIMARIES: MORE HERE THAN MEETS THE EYE? OBAMA AND THE PRIMARIES: MORE HERE THAN MEETS THE EYE? At first glance, the vote from the March Democratic presidential primary in Oklahoma looked like a misprint. The tally from Dewey County showed 86 votes for Randall Terry, 59 votes for Jim Rogers and 47 votes for Barack Obama. Terry is a lightly funded anti-abortion activist. Rogers is a frequent and largely unsuccessful candidate in the Sooner State. Obama is president of the United States. It would be nice to say that the Dewey County vote was an aberration. But it wasn’t. So far in this year’s Democratic primaries, Obama has lost 15 counties in Oklahoma, six counties in Alabama, and three parishes in Louisiana to a mixture of “Uncommitted” ballot lines and little-known opponents that basically serve as human “none of the above” options. That is fully two dozen counties that the president has lost running “unopposed” in the Democratic primaries, with a full month of voting still to go. The basic question is whether these eye-catching results have any meaning for the fall. It is certainly fair to argue that they are much adieu about nothing (or very little). Obama’s primary showings have been weakest in states in the Republican South that he has little chance of winning. And the counties he has lost have tended to be part of the rural white South, a constituency that not only drifted away from the Democratic Party in general elections decades ago but also seems particularly resistant to the nation’s first African-American president. At the national level, Obama has done well, winning more than nine out of every 10 ballots cast in the Democratic primaries. That puts him in the same ballpark with other recent presidents who have run “unopposed” for renomination and then gone on to reelection. Republicans Ronald Reagan in 1984 and George W. Bush in 2004 both ran a bit stronger than Obama has, coming close to unanimous votes in their easy glides through the GOP primaries. On the other hand, Obama has run better thus far than fellow Democrat Bill Clinton, who fell short of winning 90% of the ballots in his party’s 1996 presidential primaries. Yet Clinton arguably faced stiffer opposition than Obama in the form of Lyndon LaRouche — a “cultish,” decently funded, ballot-savvy political perennial who drew nearly half of the 1.25 million “non-Clinton” votes cast in the ’96 Democratic primaries. And unlike Obama, Clinton won every county in the primaries that he contested. Without any intraparty opposition of note, President Barack Obama is gliding to renomination like Ronald Reagan, Bill Clinton and George W. Bush before him. But some of the recent “unopposed” presidents have had a smoother ride than others. Obama has drawn a bit lower share of his party’s primary vote than Republicans Reagan in 1984 and Bush in 2004. Yet so far this year, he has drawn a higher share than fellow Democrat Clinton in 1996. Note: An asterisk (*) indicates that the 2012 results are through the primaries of April 24, with the exception of Wisconsin, where the Democratic presidential primary returns are not readily available. Results are official from all primaries except Maryland, Ohio, Pennsylvania and Rhode Island, where the numbers are nearly complete but unofficial. Sources: Race for the Presidency: Winning the 2008 Nomination (CQ Press) for presidential primary data through 2008; the websites of election authorities in Democratic primary states for 2012. In looking for clues to the fall, it is probably best to view Obama’s primary showing on a state by state basis. For sure, turnouts in the Democratic primaries have been low, but those that turn out to vote can act as a microcosm for what broader elements of the party are thinking. And what the results so far seem to show is that Obama remains strong among the basic core elements of the Democratic Party — urban voters, minorities and the college campuses — as well as showing continued appeal among an important swing element of the electorate, the suburbs. The president has tended to fare less well in this year’s primary voting in blue-collar strongholds and rural, often Republican-oriented, counties. To take a closer look, a good place to start is Michigan, where Obama took 89% of the vote in the late February Democratic primary. In Wayne County, which is anchored by the heavily African-American city of Detroit, Obama did better than that, taking 94%. In neighboring Washtenaw County, which includes the University of Michigan in Ann Arbor, he drew 92%, and received a similar share in the affluent suburbs of Oakland County. However, in suburban Macomb County, the legendary home of blue-collar “Reagan Democrats,” Obama’s share of the primary vote dropped to 83%. In Maryland, which held its presidential primary early last month, Obama took 88% of the Democratic vote. Again, he outperformed his statewide share in the cities and the suburbs. In heavily African-American Baltimore and suburban Prince George’s County, he drew at least 95% of the vote. In the liberal suburbs of racially diverse Montgomery County, Obama polled 93%. But moving outward from the population centers, his share of the vote declined sharply. In exurban Frederick County, Obama took 84% of the Democratic primary ballots. In Allegany County (Cumberland), which for all practical purposes is a part of rural Appalachia, the president drew 67%. But for wide variation within a state, it is tough to top Alabama. In historically African-American Macon County, which includes Tuskegee, Obama rolled up 97% of the vote in the mid-March Democratic primary. But across the state in another rural county, traditionally white Lamar, his share was a paltry 33% (with the rest of the vote going for an “Uncommitted” line). All in all, the comparatively large number of counties that the president has lost in this year’s Democratic primaries is noteworthy. Yet it does not appear to have deterred him from showing strength among the key parts of the Democratic coalition that he will need to turn out in large numbers in the fall. Still, there is another month to gather clues from the Democratic primary voting, starting May 8 in the swing state of North Carolina, where Obama will be joined on the ballot by a “No Preference” line. Barack Obama has won 93% of the Democratic presidential primary vote thus far this year, but limit the vote to contested primaries where there were other options on the ballot and his share of the vote falls to 84%. 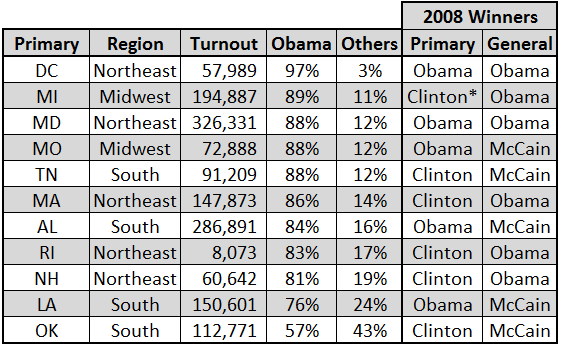 Obama has run best in Frost Belt primaries in the Northeast and Midwest; less well in party contests in the South. The president’s weakest showings thus far this year were both in the Republican-oriented region. He took only 57% of the vote in the Oklahoma Democratic primary, 76% in Louisiana. Note: Results are official from all primaries through April 24, with the exceptions of Maryland and Rhode Island, where the numbers are nearly complete but unofficial. An asterisk (*) indicates that Hillary Clinton won the 2008 Democratic presidential primary in Michigan, but that Barack Obama did not enter the contest to comply with Democratic Party objections to the state’s early primary date. Sources: The websites of election authorities in Democratic primary states through April 24.